President Cruz holds town hall with Lehman professors. 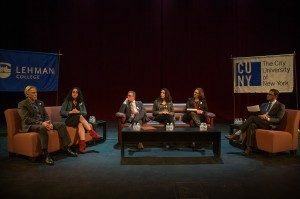 A special post election panel discussion called to “educate, engage and empower” the Lehman campus in the aftermath of the surprising presidential election results, was held on November 14th in the Lovinger Theatre. President José Luis Cruz moderated a panel of five of Lehman’s most distinguished academic leaders, covering a wide range of issues including the impact of the election on Deferred Action for Childhood Arrivals (DACA) students, and how low voter turnout among Hispanics, millennials, and African-Americans affected results. After the discussion, the panel answered questions from members of the Lehman community. Members of the panel were Laird Bergad, distinguished professor of Latin American, Latino and Puerto Rican Studies; Alyshia Galvez, professor of Latin American, Latino and Puerto Rican Studies; Teresita Levy, professor, of Latin American, Latino and Puerto Rican Studies; Dean Christopher Malone, associate dean, School of Natural and Social Sciences, and Victoria Sanford, chair of the Anthropology department. “We believe that it was critical to have this discussion with our students about how the election results might impact them and what we as a community can do to help engage and reassure them,” says Cruz. “We want them to understand that they will have the support and guidance of the entire Lehman administration,” says Cruz. The stakes of a Trump victory are high for all Americans and Lehman students are facing specific challenges in light of the President-elect’s immigration rhetoric on the campaign trail. In 2012, President Obama passed DACA, an executive action that assured some people who had come to the U.S. as children under age 16 and met certain guidelines, would not be deported. Marlon Agustin-Mendez, a Lehman junior, social work major, and one of those DACA students, is concerned that a Trump presidency could end his American dream of graduating from college and becoming a social work professional. Agustin-Mendez came to the U.S. with his family from Oaxaca City, Mexico, when he was five years old and commutes to Lehman from his home in Poughkeepsie. He says he felt reassured by attending the call-to action discussion and was prepared to organize and protest with other DREAM students and the Lehman community to oppose the new president’s immigration policies. She discussed the idea of the college as a possible “sanctuary, which in theory can be a campus where “we overtly protect” people from changes in the immigration law and possible deportation. She warned of the uptick in hate crimes and violence on college campuses, and the importance of maintaining safe spaces in the classrooms. Teresita Levy reminded the audience that the election of Trump was not just a “whitelash” but also something that the community and the nation need to take responsibility for. She says that only by accepting that responsibility, can Americans become engaged in the political process including donating money, writing politicians, organizing and/or protesting. Victoria Sanford, further discussed immigration issues and recommended the immigration clinic at CUNY law school to those seeking legal counsel. On Fridays, CUNY Citizenship Now provides free legal services with an immigration attorney. Sanford expressed alarm at the appointment of Stephen Bannon, the Breitbart media executive as Trump’s new chief White House strategist and the LGBTQ policy positions of Vice President-elect Mike Pence, which she called “frightening.” She advised the audience to “decide what is it that really matters to you” and to strategize about the many issues under possible attack by a Trump administration, including voting rights, immigration and LGBTQ rights. Chrisopher Malone and Laird Bergard analyzed the political side of the election. Bergard said that low turnout among millennial, Hispanics and African-Americans, had a disastrous effect on the election for Hillary Clinton. Malone discussed “pushing back” on the concept that the president of the United States is a “reflection of us” as a people”—and mentioned the dismay of his political science students about the outsized and outdated role of the Electoral College. The panel and the administration assured the audience that the forum was just the beginning of what would be an ongoing process to address student concerns and issues. On Thursday November 17, the counseling center will hold a post-election debriefing called “How Do We Heal” at 2 p.m. in the Student Life Building.